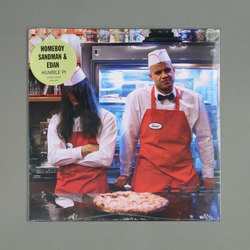 Homeboy Sandman & Edan - Humble Pi. Vinyl LP. Bleep. The loquacious Homeboy Sandman partners with mysterious beatsmith Edan for a record of good old-fashioned rap music. Humble Pi comes from that lineage of Madlib, J Dilla, Guilty Simpson et al. Edan’s instrumentals for cuts like ‘Rock & Roll Indian Dance’ and ‘Grim Seasons’, all wobbly vinyl samples and off-kilter drum programming, stick like grit in your teeth. Meanwhile Sandman’s bars coast in and out of the beats, offering a mix of street poetry and mystic daydreaming. It’s no surprise that this one’s turned up on Stones Throw.